Multi-mode Optical Fiber is a type of optical fiber,which is most commonly used in computer networks to communicate over short distances like within a building. Previously we published articles about Fiber Optic Connectors, How Optical Fiber Works and practical example usage of Multi-mode Optical Fiber with Fiber Optic Headphones. The speed of transmission with Multi-mode Optical Fiber is around 10 Mbit/s to 10 Gbit/s at a distance of 600 metres, which is more than sufficient for most LAN networks. Fiber with larger core diameter (greater than 10 micrometers) may be analyzed like radial optics. Such fiber within thread thread has the property to keep the light to keep along the core by using total reflection. Limiting angle (minimum angle for total reflection) is specified by the difference between the refractive index of the core and mantle. Numerical aperture of the optical system is a dimensionless number that is denoted is expressed in mathematical notation n sin ?, where n is the refractive index of the atmosphere. The threads are locked under many angles and it is spread by the total internal reflection, creating a way of signal propagation. It is used for short distances. Obvious problems includes chromatic dispersion, which limits the transmitted bandwidth. The graded-index, refractive index decreases with distance from the center of the thread. Ray took a sinusoidal curve, which reduces dispersion. The fiber is made up of thousands of thin layers which differ in refractive index to fix the issue. The beam from the axis of the core, goes into the upright and eventually returns to the axis of the core. Advantage of Multi-mode Optical Fiber is the elimination of distortion, each thread runs out at the end at roughly the same point in time very often useful in data applications. 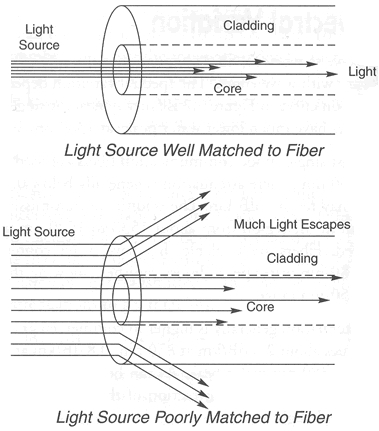 In short, Multi-mode Optical Fiber is precise than single-mode optical fiber. Equipment used for communications over multi-mode optical fiber is much less expensive than that for single-mode optical fiber. Typical transmission speed limits are 100 Mbit/s for distances up to 2 km (100BASE-FX), 1 Gbit/s to 500-600 m (1000BASE-SX), and 10 Gbit/s to 300 m (10GBASE-SR). Due to the high capacity and reliability, multi-mode fiber is mainly used for backbone in buildings. Architecture standards such as Centralized Cabling solves the problem of replacing the last mile of copper wiring for optical lines. Multi-mode fibers are described according to the size of the core and cladding. Threads are described using the ISO 11801 standard ” OM1, OM2, OM3, and which is based on the bandwidth of the multi-mode optical fiber. This Article Has Been Shared 5229 Times! Data Center is the building or premises in which the central computing technology of one or more companies or organizations are located. Cite this article as: Abhishek Ghosh, "Multi-mode Optical Fiber : Basic Details," in The Customize Windows, May 16, 2013, April 19, 2019, https://thecustomizewindows.com/2013/05/multi-mode-optical-fiber-basic-details/.